The Andalusian horse is one of the most ancient horse breeds in the world with evidence of its existence on the Iberian Penninsula dating back to pre-historic cave paintings. The Andalusian is called a Pura Raza Espanola (PRE) in Spain, which simply means The Pure Spanish Race. The term Andalusian is used in many countries to refer to the Spanish horse and it apparently arose from the fact that there are a concentrated number of stud farms located in Andalucia. The breeding is carefully regulated by The Jefatura de Cria Caballar who hold the Spanish State Studbooks where the ancestry of many horses can be traced back to the famous Cartujano lines established 600 years ago by the Carthusian monks. Stud book accuracy is maintained through a long paper chain and every registered foal must be microchipped and its parentage verified both through DNA testing and microchip identification. Then at 3 years and above, they must pass a strict exam (Revision) to be registered and approved for breeding (APTO) in the Spanish Stud Book. Although the population of Andalusian horses in the UK (and internationally) is very small in comparison to other breeds, the Andalusian has captured the imagination of thousands with its overwhelming beauty, elegant carriage and wonderful temperament. There are just over 500 registered Andalusians in the UK out of a total of 1.35 million horses kept privately in the UK. Making up only 0.04% of the UK horse population, the Andalusian is one of the rarest breeds in the UK. The Andalusian has a small population, not only in the UK, but worldwide. 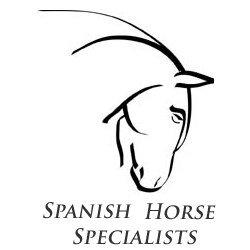 There are only about 12,500 pure bred Andalusian horses in Spain and only 4,000 Lusitanos in Portugal (IALHA). Much of this rarity can be attributed to history and to European wars as the Iberian horse was the warhorse of choice and regarded without equal. The compact conformation, strong neck, powerful hindlegs and strong hooves made the horse extremely resilient, flexible and agile. Coupled with a trusting and kind disposition, the horse soon became the premier mount for royalty and grand riding academies were formed all over Europe where dressage and high school riding flourished with the Iberian horse at their foundation. After 2,000 years of European warfare, the pool of Spanish and Portuguese was very small and the breed was threatened with extinction. Consequently, exportation was very restricted and the export ban was only lifted in 1962. Many other breeds have been founded and improved by the Spanish horse. The Lippizaner of the famous Spanish Riding School in Vienna, the Quarter Horse, Appaloosa, Connemara, Cleveland Bay and many others owe much of their characteristics to its strong and prolific genes. This can also be seen in the many part-breds of today giving to the equestrian world a variety of talented, spectacular horses that can successfully compete in any sphere. The Andalusian breed is experiencing a rapid growth in popularity all over the World. At present the old Carthusian bloodlines are much in demand as are the more �functional� bloodlines suitable for competitive dressage such as Escalera and Bohorquez. Other breeders however, take pride in producing a very "classical" or �baroque� style horse, true descendants of the original Carthusian horses with their specific physique. The colour of the coat also influences the price of the horses. Some breeders are now specialising in producing bigger sporthorses types, particularly as horses are being exported to countries where riders are often taller than in Spain. Big horses with a lot of bone are more expensive because they are harder to find. In Spain dark coats are very much in vogue at the moment, whereas internationally grey coats are often preferred. Founded in the XV century by Carthusian monks whose genetic heritage has been safeguarded to the present day. Known for their baroque characteristics, extreme elevation, impulsion, beauty and gentle temperament. Revered bocado breeders today include: Romero Benitez (who produced Invasor III who represented Spain in the Olympics), Cardenas, Guardiola, Roberto Osborne, Terry, Lovera, Pallar�s, Urquijo and others. One of the oldest and most prestigous bloodlines, famed for breeding bay horses of uniformity and functionality . When the father died the son and daughter split the brand into Jose Luis de la Escalera and Maria Fernanda de la Escalera. Escaleras have a little less elevation, but have better extension, impulsion and suspension and as such are sought after for dressage. The Spanish Military Stud and the hallmark synonymous with quality in pedigree and performance. Evento, the olympic dressage horse was bred by the YM and still stands at stud in Jerez. Famous carthusian lines bred in the salt marshes of the Guadalquivir. Known for tradional flea bitten coats and black coats. Typically an unregistered PRE is called an Andalusian or a 'Spanish type' horse, they do not have P.R.E. papers but do have their specific looks including the full mane and tail, and the elevated movements. Lusitanos are the Portguese Pure Bred horse, but originate from the same gene pool as the Andalusian or the Iberian horse and are also bred in Spain too. The Portuguese started their own stud book to breed the characteristics they sought. The Lusitano breed�s original purpose was also as a warhorse and later for bullfighting. The horses are noble, brave, powerful and quick, with compact conformation which inspired the description, "a horse for a King in days of victory". Lusitanos range from the larger, heavier-set, Spanish-looking ones, to the more traditional, finer, agile, almost ethereal and "hotter" Veiga type. A Lusitano is similar to an Andalusian, distinguishing features are a narrower and sub-convex head and a more slanting croup. They are considered to be more serious than Andalusians with a great aptitude for concentration, whereas Andalusians are considered bolder and even more tolerant. Tall, powerful horses with rounded croup, nearly straight head profile and very functional elegants gaits. Excellent fo bullfighting and dressage. Longer, stronger horses with high croups that are very good for dressage and driving. The most typical characterisitics of a Lusitano with the convex heads, flat, thin legs with strong hocks, fantastic impulsion and beautiful, flexible necks. Nervous and gallant. Novilheiro is one of the most internationally famous lusitano stallions, who took the showjumping world by storm with John Whitaker. He had Veiga and Andrade origins. Sylvia Loch, internationally-recognised classical rider, trainer, and judge and internationally published author of numerous books and videos on classical riding, is one of the most famous Lusitano enthusiasts and is considered an authority on the Iberian horse. Hispano-arabs (Andalusian cross Arab) are a strong, resilient type with great presence and beauty often bred for Doma Vaquera due to their strong quarters and ability turn on the haunches and accelerate at pace. They make excellent all rounders and good endurance horses. A Tres Sangres (meaning Three Bloods) is an Andalusian cross Anglo-Arab and is a cross favoured for the Bull Ring and Doma Vaquera: combining speed, height, beauty and strength. Other notable crosses to be found are the Iberian horse crossed with Quarter Horse (also known as an Azteca) or a Percheron cross known as the Spanish-Norman, however, generally the Spanish are very loyal to the pure breed of their country and thoroughly devoted to securing its future. *This research was based on a number of different sources including the IALHA, BAPSH, Conquistador Magazine and Horse and Hound Magazine. See Information Centre for further reading.